Contrary to the condition's name, heart failure doesn't mean the heart has stopped pumping—it's just not working at full strength. It can often be managed with medications and lifestyle changes, but its progression needs to be monitored closely. Now scientists have developed a new test strip that could potentially allow patients to do this at home for the first time. Their study appears in the journal ACS Nano. In the U.S., nearly 6 million people live with heart failure, and about 1 million hospitalizations occur each year are related to the condition, according to the American Heart Association. Closely tracking the condition after diagnosis is important for adjusting treatment and preventing emergency room visits. Antigens called ST2 and BNP are good indicators of heart failure and how it's progressing. But currently, analyzing the levels of these biomarkers requires both trained personnel and sophisticated lab equipment. Feng Xu, Min Lin and colleagues wanted to devise a simple test to enable doctors and patients to carry out the same analysis at the office or at home. The researchers developed a paper-based test that requires only a small blood sample of 10 microliters. A blue dot glows on the strip if ST2 is present in the sample, and a green dot glows if it contains BNP. The colors' intensities increase with concentration, which indicates a person's heart failure is likely becoming worse. A smartphone app can analyze the readout and send the results to the patient's doctor, who can adjust the patient's treatment accordingly. Testing 38 serum samples from people with heart failure showed that the paper test closely matched conventional techniques. Heart failure (HF) is the end-stage of cardiovascular diseases, which is associated with a high mortality rate and high readmission rate. Household early diagnosis and real-time prognosis of HF at bedside are of significant importance. Here, we developed a highly sensitive and quantitative household prognosis platform (termed as UC-LFS platform), integrating a smartphone-based reader with multiplexed upconversion fluorescent lateral flow strip (LFS). Dual-color core–shell upconversion nanoparticles (UCNPs) were synthesized as probes for simultaneously quantifying two target antigens associated with HF, i.e., brain natriuretic peptide (BNP) and suppression of tumorigenicity 2 (ST2). 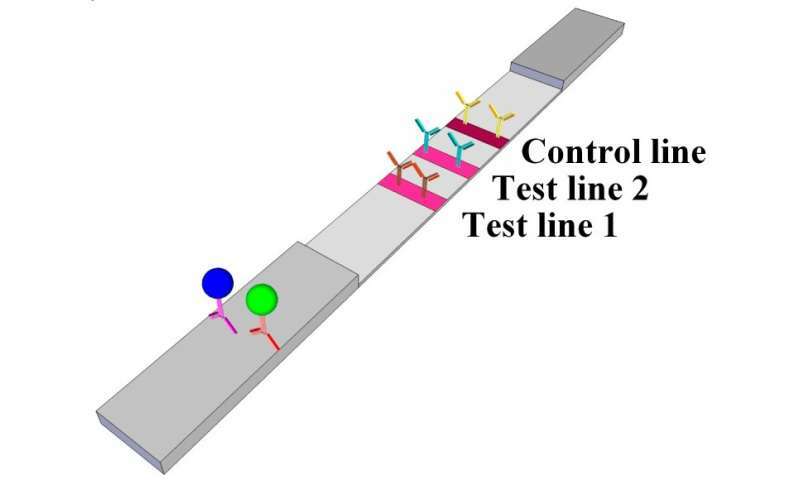 With the fluorescent LFS, we achieved the specific detection of BNP and ST2 antigens in spiked samples with detection limits of 5 pg/mL and 1 ng/mL, respectively, both of which are of one order lower than their clinical cutoff. Subsequently, a smartphone-based portable reader and an analysis app were developed, which could rapidly quantify the result and share prognosis results with doctors. To confirm the usage of UC-LFS platform for clinical samples, we detected 38 clinical serum samples using the platform and successfully detected the minimal concentration of 29.92 ng/mL for ST2 and 17.46 pg/mL for BNP in these clinical samples. Comparing the detection results from FDA approved clinical methods, we obtained a good linear correlation, indicating the practical reliability and stability of our developed UC-LFS platform. Therefore, the developed UC-LFS platform is demonstrated to be highly sensitive and specific for sample-to-answer prognosis of HF, which holds great potential for risk assessment and health monitoring of post-treatment patients at home.